Alternate image is cropped to 1920x1080 wallpaper dimensions. To distract himself from the woes of managing a failing alchemy shop in a deteriorating building whose rent he cannot pay, our hero the gnome decides to take his equally dismal boat out for an afternoon of fishing. He drifts carefully into his favourite corner of the lake and sets out his line. Some time passes with blissful silence and calm before the slightest of whispering catches his ear. He glances to his left. 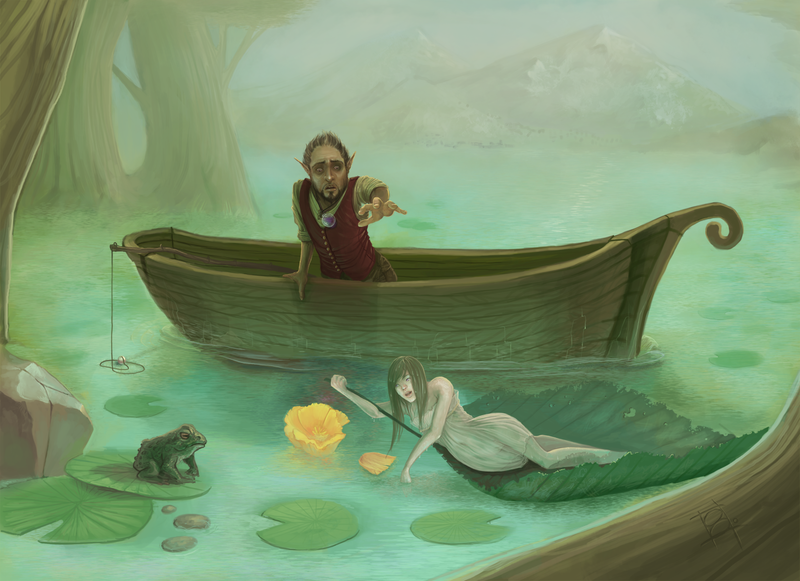 To his surprise, he sees nestled gracefully upon a floating leaf a delicate water-sprite, lounging drowsily whilst maintaining a one-sided conversation with a particularly indignant toad. Enchanted, he clumsily drops his fishing pole and stumbles forwards, reaching towards the creature. Just a little further, whispers a voice from the deepest caverns of his mind. Just one little touch.